A Memorial Day visit to the National Gallery on the Mall in Washington, DC to view their wonderful, current exhibition - Degas/Cassatt - which will run through early October, set my creative juices flowing. I never fail to walk away from time spent at a museum without finding much to inspire, think about and mull over as I take time to digest what I've seen and this visit did not disappoint. A side event, an unexpected additional exhibition of works by Andrew Wyeth, also caught my attention at the museum and I will dig into that one at a latter posting. But for today, I wanted to speak about some of my favorite works from this marvelous exhibition of works by two of my favorite artists. Maybe 100 pieces hanging across the several gallery rooms, many of which I was familiar with, but also an equal number of etchings and drawings and paintings that I was not previously acquainted with, kept my rapt attention as I moved from one work to the next. 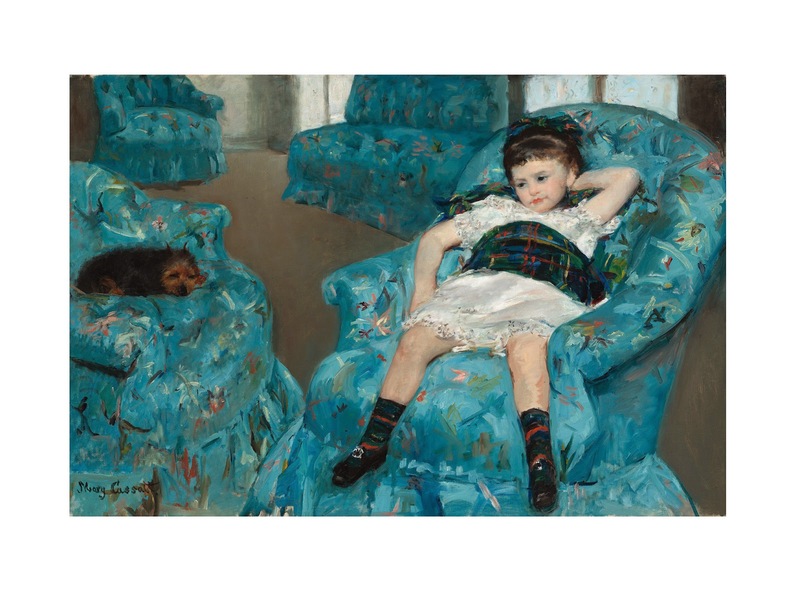 In the work shown above, Cassatt's very well known Little Girl in a Blue Arm Chair, which was prominently displayed in the first gallery, an interesting discussion of the work drew great attention from the crush of visitors on a panel displayed in front of the work. It mentioned a letter evidently written by Mary Cassatt that discussed how Degas had actually worked on this canvas, having made suggestion on how to alter the work into a more dynamic composition from Cassatt's original blocking out of the various elements in the work. Quoted from the accompanying brochure to the exhibition, discovered during a recent cleaning and technical analysis of the work - "Under magnification, strokes of grayish almost silvery brown paint not found elsewhere in the picture are apparent in the corner of the room beyond the furniture. Evidence of intentional abrasion of the surface in this area also suggests the presence of a different artist's hand. Similar paint handling can be found in a number of Degas's works from this time, but is completely absent in Cassatt's work." The idea here basically was that, Cassatt having designed the work around a single, straight lined back wall across the upper margin of the work and parallel with the lower edge of the canvas, left the work rather flat and Degas, evidently, reworked the background to give a more angular and thus more dynamic movement to the room, which necessitated Cassatt's rework of the armless chair in the background as well as other aspects of that back wall. How interesting! 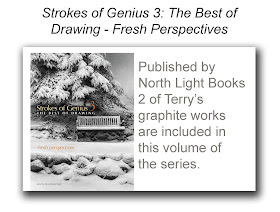 As an artist, to be able to see how a master from the past was advised to make alterations to form a more interesting and appealing composition by a fellow master, reinforces that idea that we must make ourselves, as artists, open to the input of our peers; having another pair of eyes to look over our shoulder while at work and see aspects that we are not aware of (being so 'close' to our own work) is a much appreciated occurrence. 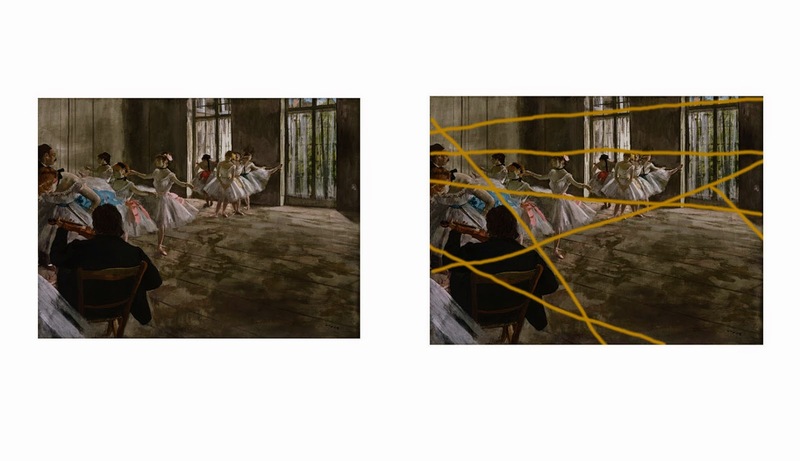 As you can see in the image below of the same work, I've indicated with the tan line, the horizontal line that was Cassatt's original idea for the back wall, and with the brighter yellow line, the suggested and ultimately rendered angular stab that Degas offered. And with that discussion of Degas's involvement in altering Cassatt's idea for this work, we find the crux of the impetus for this exhibition - the peer connection and friendship that was developed between these two remarkable artists in the later years of the 19th century and how they grew alongside one another, fed off each others ideas and personal explorations of painting their favorite subject matter - the human figure and depictions of 'modern' life - and intermixed with their fellow painters in France. Degas invited Cassatt to exhibit with the Impressionists in the late 1870s and the intense friendship and mutual respect for each others work began, continuing on, even after their work began to move in different directions, until Degas's death in 1917 (Cassatt having lived on till 1926). I've long appreciated and respected the intense compositional workings of Degas and also the appealing depictions of family life that Mary Cassatt became so well known for, and to see the apparent collaboration that took place between the two during the 1870s in the works spotlighted in this exhibition, was eye opening. 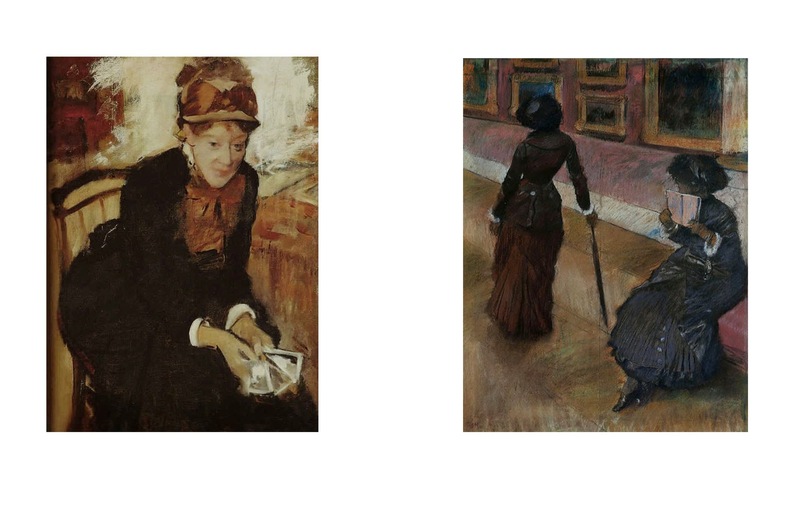 One Degas work in particular included in this assortment, reached out to me and I marveled again at his well-thought-out preliminary arrangement of all the elements of his overall design. 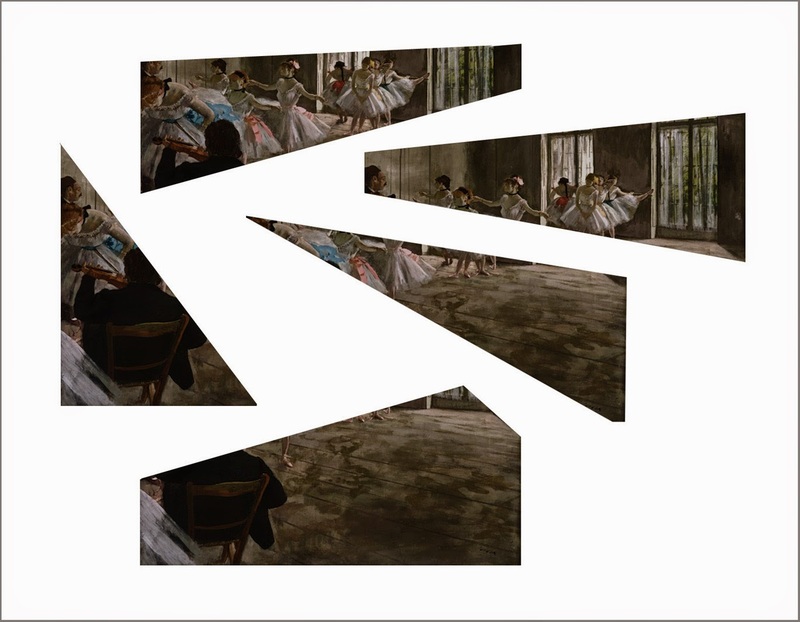 In the image immediately below, you see his finished work, on the left (one of his iconic interiors with dancers) and on the right, how I've divided up his overall composition into the various triangles that each important group of elements occupy within the entire work. 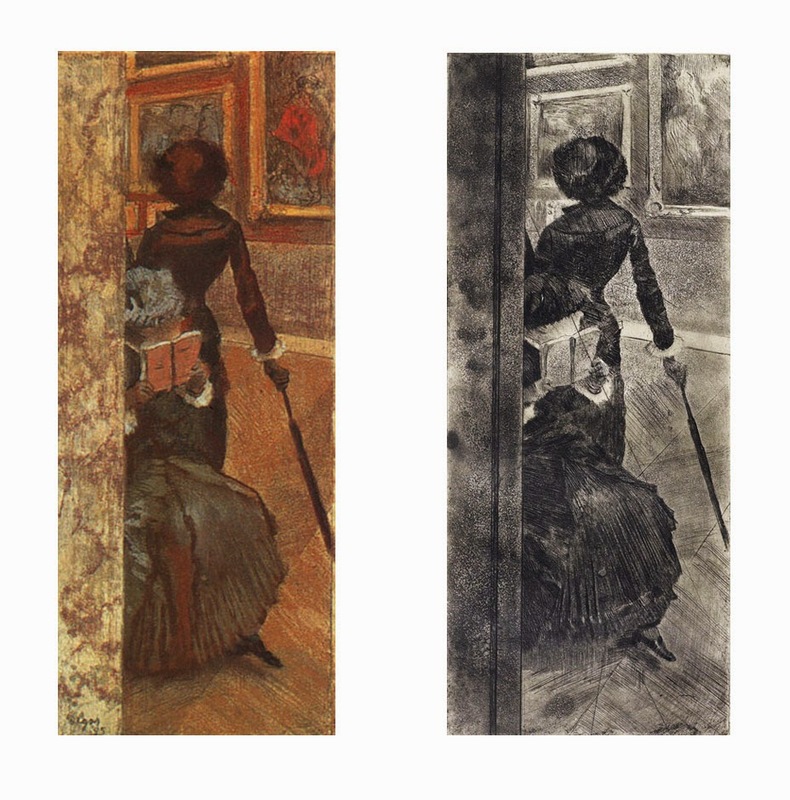 And also, in connection with his suggestion to Cassatt about shifting the angle of her back wall, you can see that, rather typically for Degas, he has partaken of that same dynamic thrusting of the back wall that immediately gives this work a more appealing viewpoint. What seems upon initial viewing of the work to be a sudden serendipitous encounter with a dance class full of students and musicians, is in actuality the result of well placed objects, features, figures and lines of perspective throughout, which move the viewer's eye around the work with specific intention; nothing is left to chance, nothing is indicated randomly. In the grouping below, I've separated some of the various triangular segments that I outlined in the image on the right above of the overall composition so you can see more clearly how all fit together but also how each wedge encompasses a dominant grouping of the important individual elements that come together as a harmonious whole. Through their friendship, Degas often used Cassatt as a model in his work, as shown below in Visit to the Museum, with Cassatt standing and her sister, Lydia, seated. I was very taken with this work and enjoyed seeing all the soft and lost edges that Degas used in the clothing and especially the background, only choosing to spark the work with more details and harder edges where absolutely needed to bring focus to the important aspects of the overall work (as seen in the details to the right). 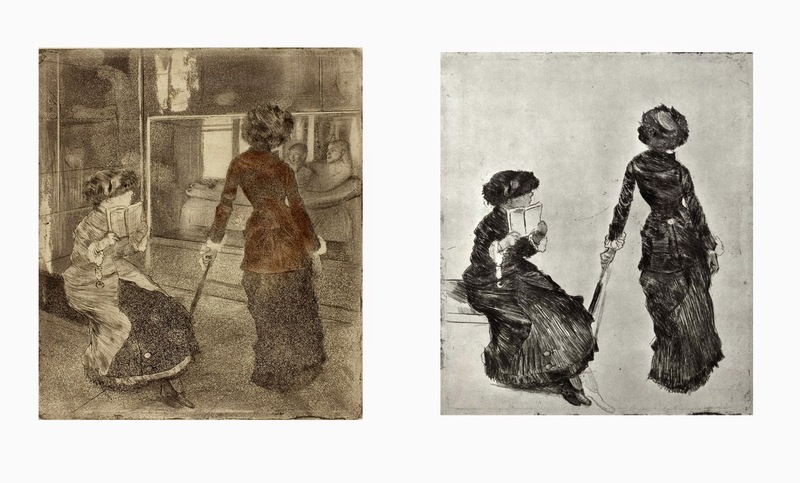 In the Degas etchings below, Cassatt again is used as a model for this lovely figure study which, in the one to the left, has been colored over with pastel on the original monochromatic etching. Yet another pair of etchings (below) reveal more explorations of the same theme and I really enjoyed seeing so many more in this series at the gallery. I was especially drawn into these through Degas's delineation of the strong angle of the stance and interesting implied gestural movements. 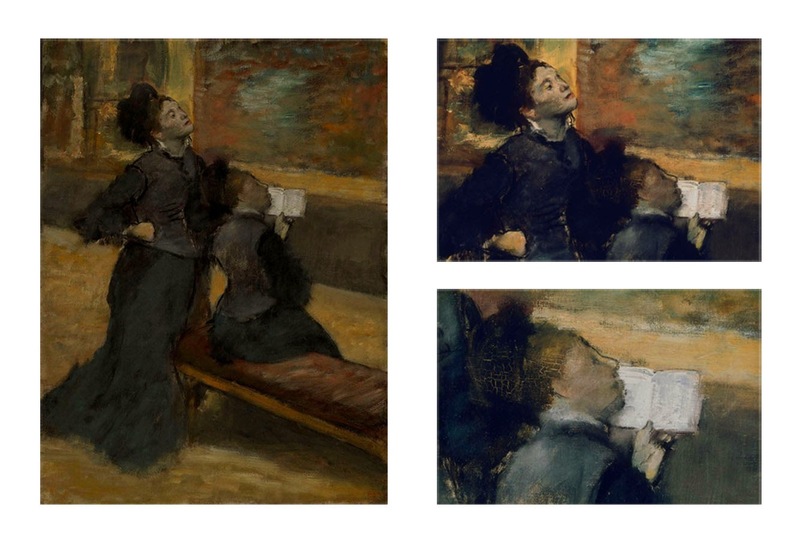 In the two finished paintings below, you can see on the right, a final version of the image from above that Degas wound up turning into a painting, one of many in the exhibition exploring that recurring theme based on museum viewing. 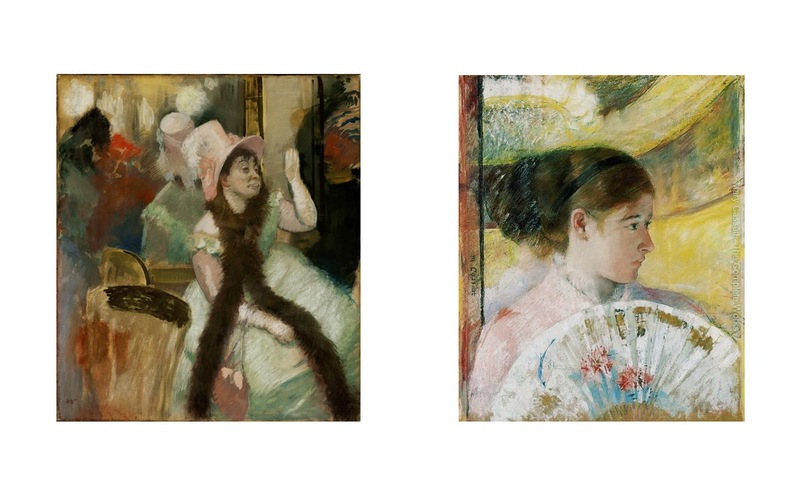 On the left is one of Degas's iconic portraits of Mary Cassatt in which you can well see the scrubby brush work that helped to define Degas's hand within the analysis of Cassatt's girl in the blue chair. 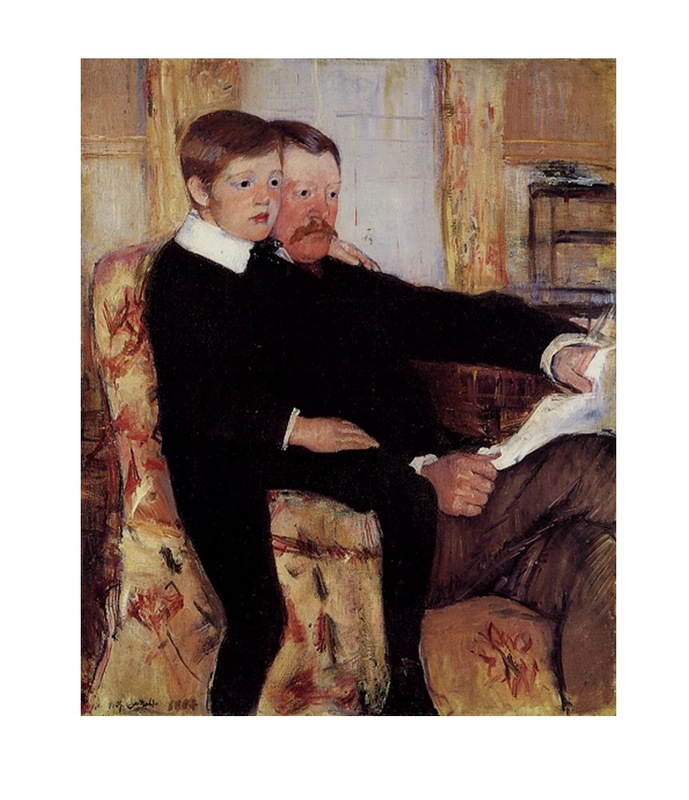 This wonderful portrait, above, of Alexander Cassatt (Mary's brother and president of the Pennsylvania Railroad at the time) and his son, shows a very evocative pose by Cassatt and I was very taken with the intense abstract shapes formed by the black masses of the boy's outfit and Alexander's coat. 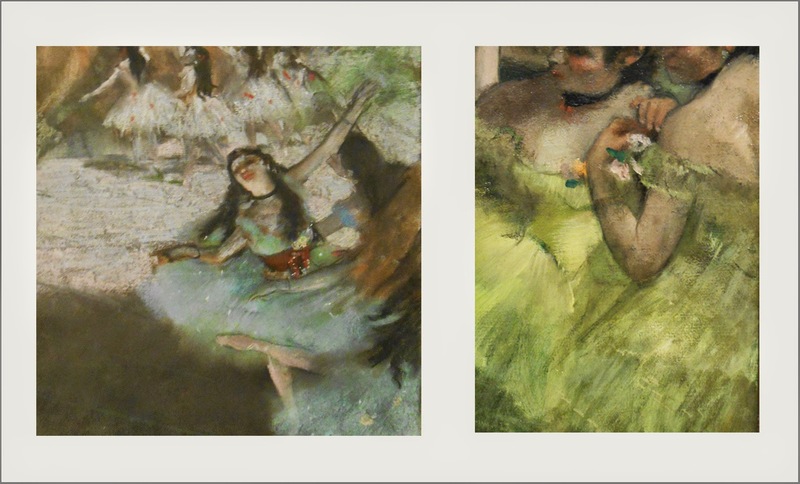 Degas and Cassatt both explored interesting combinations of materials and mediums in their works, incorporating metallic paint, distemper (pigment mixed with glue) and pastel, as indicated in the work below on the left, Degas's Portrait After a Costume Ball, and Cassatt's At the Theater which mixed pastel and gouache with metallic paint. Even though the character and 'feel' of each work are rather different, I felt a strong similarity at the same time, between both works as to their general softness and rendering of subject matter. 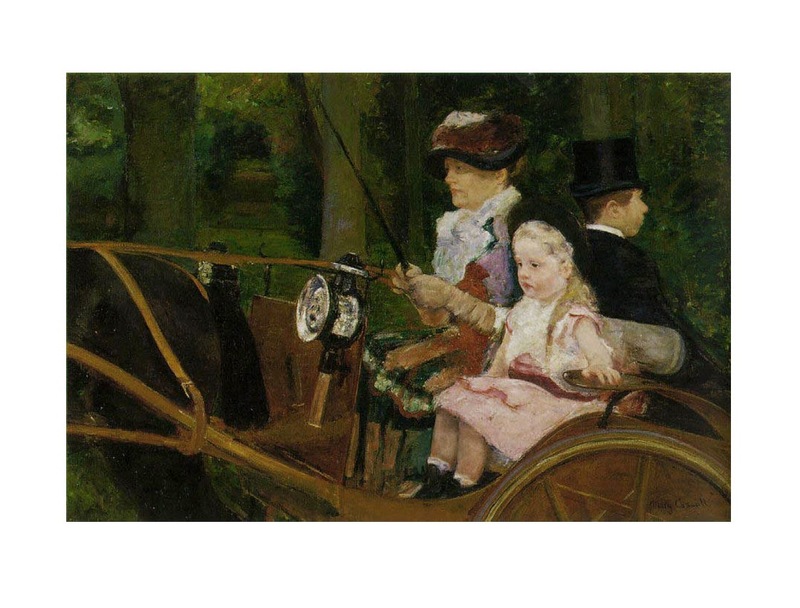 After their decade or dozen years of a more intense working relationship, Degas and Cassatt began to find inspiration in divergent subject matter and Cassatt moved more toward the depiction of family life and a softer interconnection between mother and child, which she has now become more known for. The work below by Cassatt, was one I was not familiar with prior to my visit to the National Gallery and it really caught my attention for its unusual compositional form and lovely figurative rendering. I really studied the intense metallic 'feel' that she was able to develop on the carriage lamp as it sparkled at the focal point of the work. 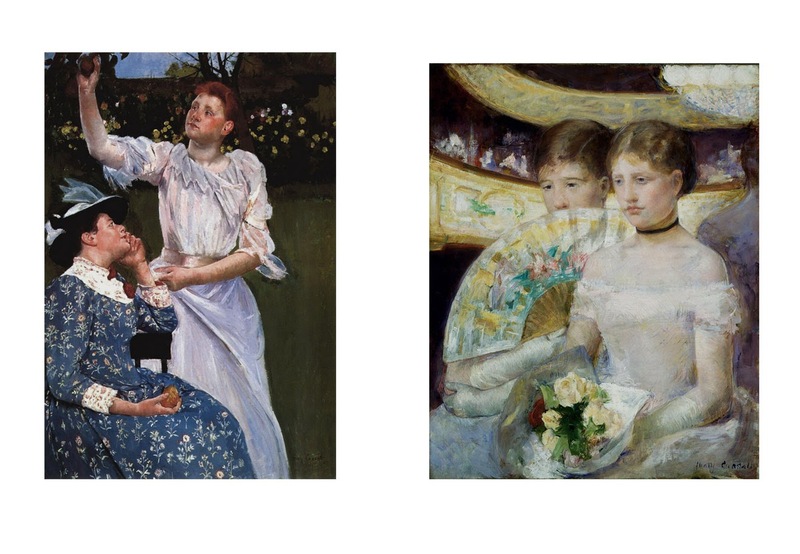 These last two favorites of mine, above by Mary Cassatt, truly offered fine examples of her later works that featured more about the delicate interaction between her female subjects. I was especially intrigued by Cassatt's use of the very distinct 'S' shape in her composing of the work on the left - starting at the arm reaching up and moving through the body of the standing figure, across to her left arm running across and down the right arm of the seated figure and across to her hand holding the fruit. Random placements? Hardly. I will relish digging through the catalog of this marvelous exhibition and discovering more about the remarkable connections between Degas and Cassatt and would recommend highly, a summer visit to the National Gallery to see this incredible sampling of their interconnected ideas and works. Fields of colorful Dutch flowers, portrayals of everyday life in the low country, evocative portraits of the 'common folk' . . . these are the subjects that George Hitchcock chose to focus upon in his wonderful late 19th century canvases. Another one of my recent 'discoveries' while visiting The Art Institute of Chicago a month ago, American painter, George Hitchcock, born in Rhode Island in the mid part of the 19th century, spent several decades residing in Holland toward the end of the century, capturing the flavor and feel of the country that he so came to love. 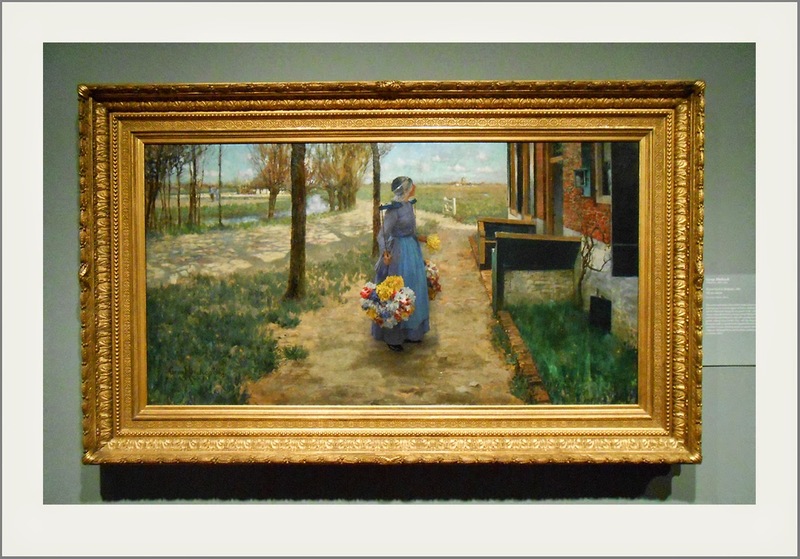 As noted in my posting of May 12th, the two works seen in Chicago, The Annunciation and Flower Girl in Holland, made me desirous of finding out more about Hitchcock, with whom I had not previously been familiar, so I spent some time over the last week seeking out more information about him on line. Foregoing joining so many of his American expat fellow artists who landed in Paris during the later half of the 19th century, after traveling around in Holland he decided to put down his paints and easel in Egmond on the North Sea coast where he would remain painting and teaching through the early years of the 1900s. 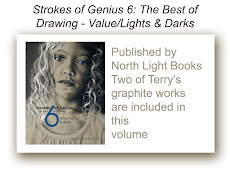 I was very taken with his two works in the collection in Chicago and equally so upon finding many more examples of his work over this last week. Here are a few of my favorites pulled from various sites on line. 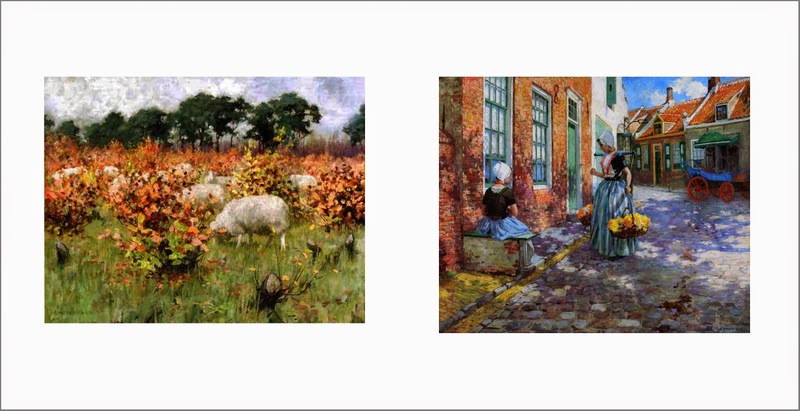 These first two works, below, show his love of the Dutch countryside and town life - Grazing Sheep - left, and Dutch Flower Girls. 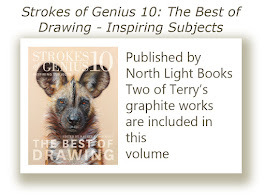 I was especially taken with his figurative studies, two of which are shown above. 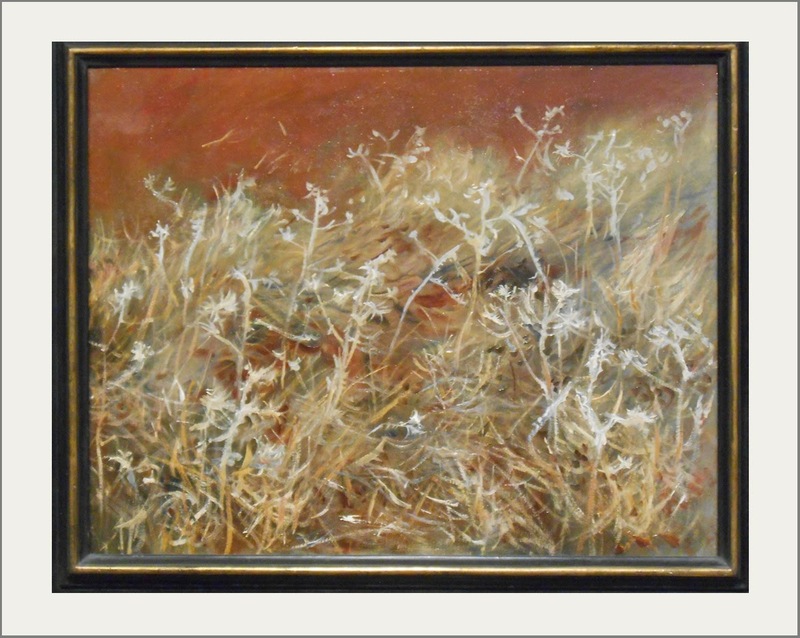 The Christening - left and Calypso, are lovely examples of his soft brush work and evocations of mood. 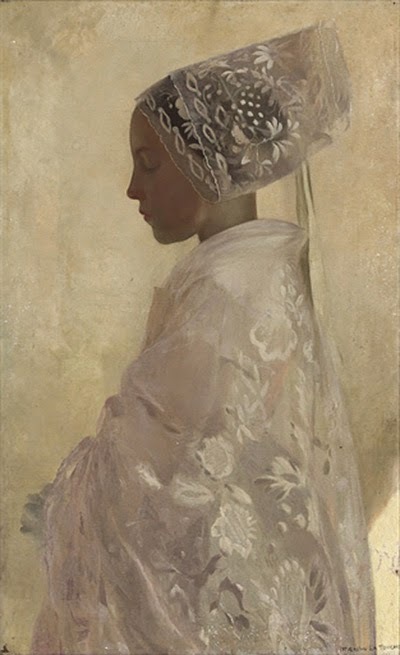 I very much like his delineations of fabric and the different character and feel given to each material in these two works, as well as his intricate yet brushy detailing of the head wear in The Christening. The next two works also show very emotive poses of his subjects - The Wayfarers (left) and Milkmaid - with the one on the right particularly interesting to me in the way in which Hitchcock developed a very strong 'S' compositional design, moving the eye from the lower left into the work and following along through the vertical of the figure across to the path that moves back and across the bridge and up through that opening in the distant tree line and across the top margin as the trees become darker and more defined as they move across to the upper right corner of the canvas. 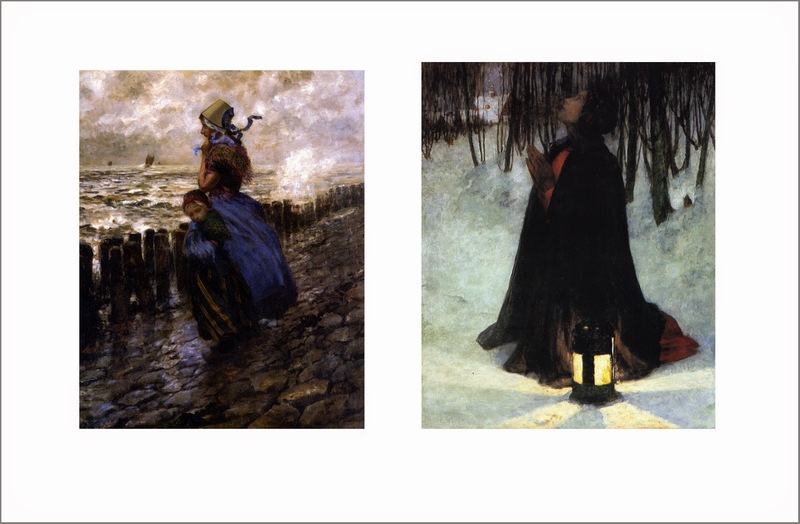 In the next pairing of figurative works, on the left - Looking Out to Sea, on the right - Dream of Christmas, Hitchcock again gives his subjects a strong emotional hold over this viewer, enhancing the strength of that connection through equally evocative and moody surroundings. In this last work that I've selected as one of my favorites (below), Hitchcock develops religious overtones as he did in The Annunciation viewed in Chicago. The Flight Into Egypt, shy of its title, might otherwise have been a lovely, simple and softly rendered landscape in my view, with its rather monochromatic palette and serene beauty, but Hitchcock has imbued it with that stronger connection to religiosity, even without the title, in such a subtle manner that it certainly drew me in even though I am not generally drawn toward works with that stronger connotation and especially those that tend to be more hard handed and intense. 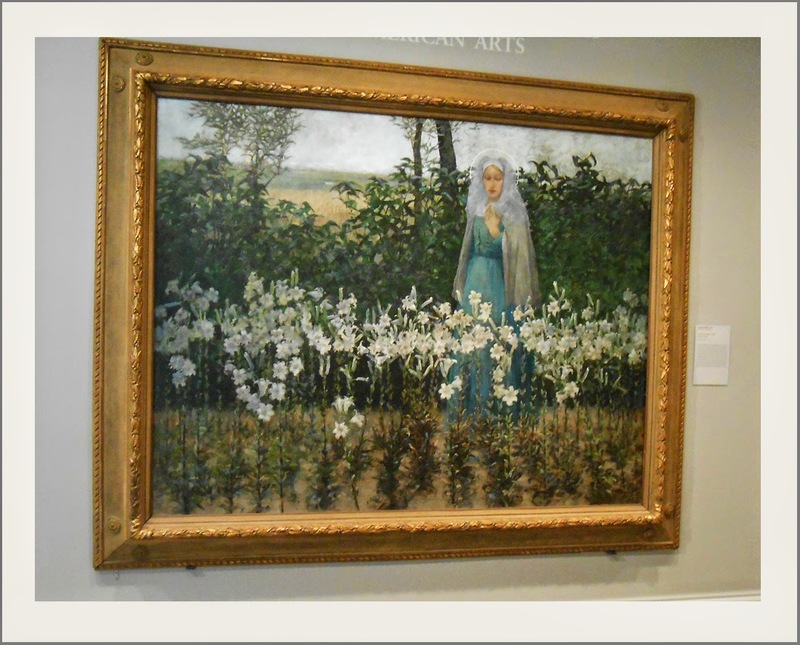 Since my return from Chicago a couple weeks ago, I've had a chance to do a bit of exploring with regard to the French late 19th Century painter, Gaston La Touche, whose marvelous painting, The Pardon, Brittany (see my postings from May 10th) , astounded me when 'discovered' at the Art Institute of Chicago. Having not been familiar with the artist prior to my visits to the Art Institute, I was eager to find out more about him and his work. Today, I'll post some of my favorite images I've found on line of his body of work. This first work, above, The Relics, painted in 1899 (several years prior to his The Pardon), struck me as encompassing a lot of what was to come in the work that stopped me dead in my tracks in Chicago. Here he has introduced a beautiful luminosity with candle light and reflected light as well as that coming in through the window and, as in the later work that I stood in front of in Chicago, it captures attention by drawing you into the scene just where those candles sparkle. As I've come to be aware, apparently in his earlier paintings, prior to the early 1890s, his works took on a subdued tone, as he depicted the daily life of the 'average man'. 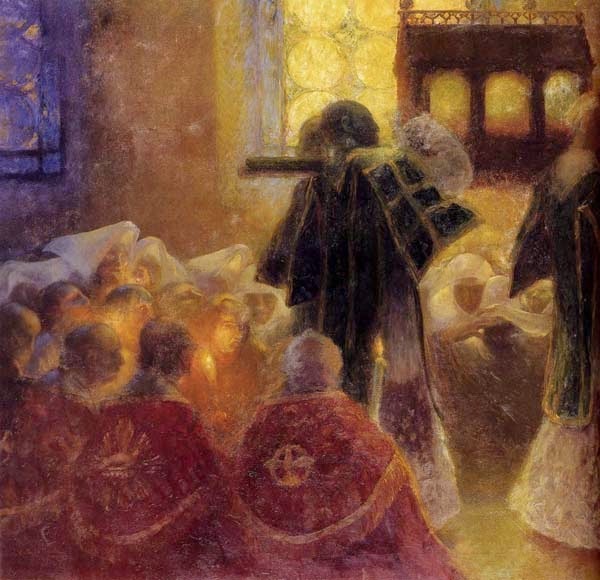 His palette was somber and his brush work was more defined with fewer lost edges as seen in the earlier work below, The First Born, painted in 1883. It is still a beautifully composed image that infuses the scene with a similar luminosity as seen in his later, more colorful and energetic work. 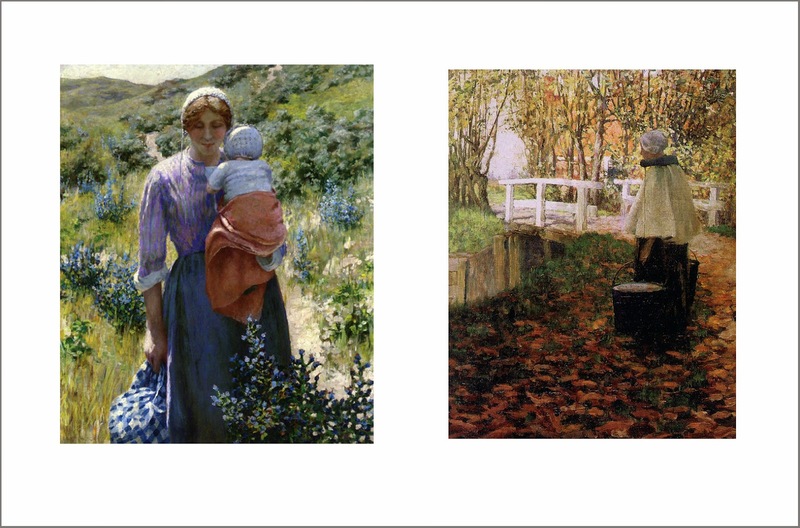 In the next two works, both painted in 1889, one can see the beginning of a slight shift in color palette as well as subject matter. 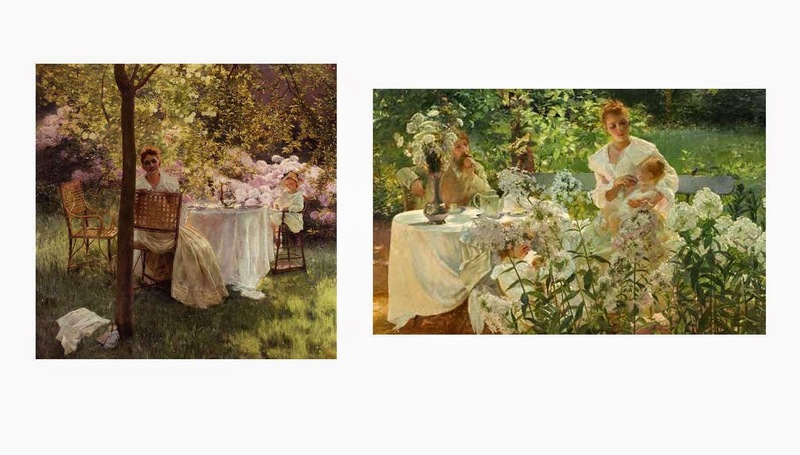 In Peonies (on the left) and Phlox, La Touche shows a lighter, more airy take on life and his brush work has begun to take on a bit looser feel in some parts of the work, introducing a more impressionistic feel. 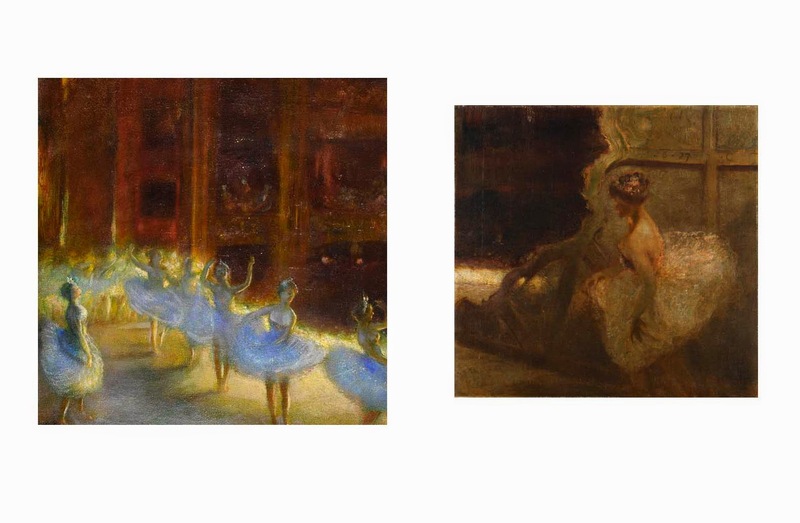 In the two works immediately above, both scenes from the ballet, just as Degas and others of the Impressionist cadre had been taken with the energy and excitement of the ballet, La Touche took his turn to portray in his way, that interesting subject matter. 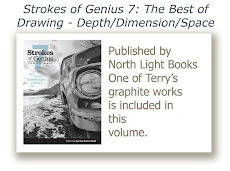 And, it is easy to see that these works now begin to move his brush work to a softer touch, more lost edges appear, less definition to the forms and more of the modeling being taken care of through great value shifts and loosening of details. And speaking of Degas . 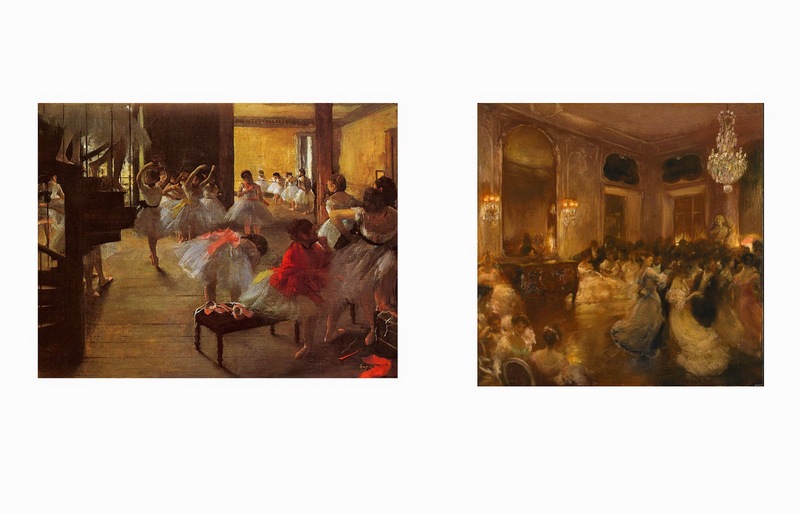 . . in the two images below (Degas on the left and La Touche on the right) I found an interesting connection between the flurry of activity in both, the swirls of clothing and general indications of movement throughout each work though both based on different gatherings. As I was looking through images of La Touche's works on line, when the one on the right, The Ball, popped up on my computer screen, I immediately saw an image of the Degas work in my mind's eye and upon finding it in a saved file on my computer, I was quite taken with the similarity of feel to both works (though the La Touche was painted quite a bit later than the Degas, they struck me as having the possibility of having been done within the same year). Another interesting pairing of two of La Touche's works, above, (Carnival on the left and L'Entr'Acte on the right) continue to show swift brush strokes and modeling based on strong value shifts. 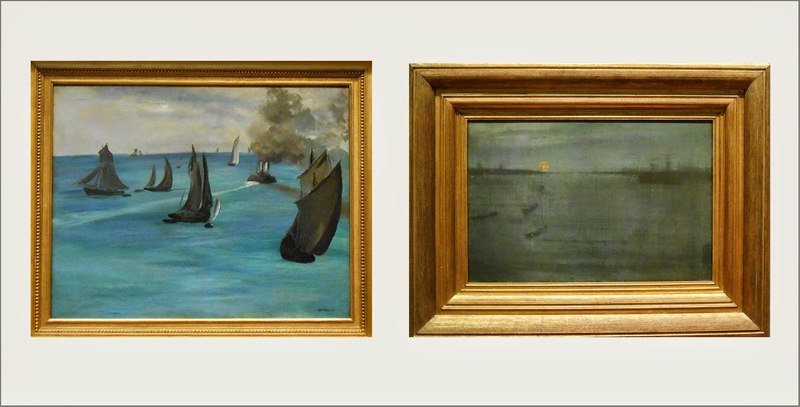 In the trio of works below, there is again, an interesting connection between works by La Touche (on both left and right) and that of Maxfield Parish (center) all painted within several years of each other. 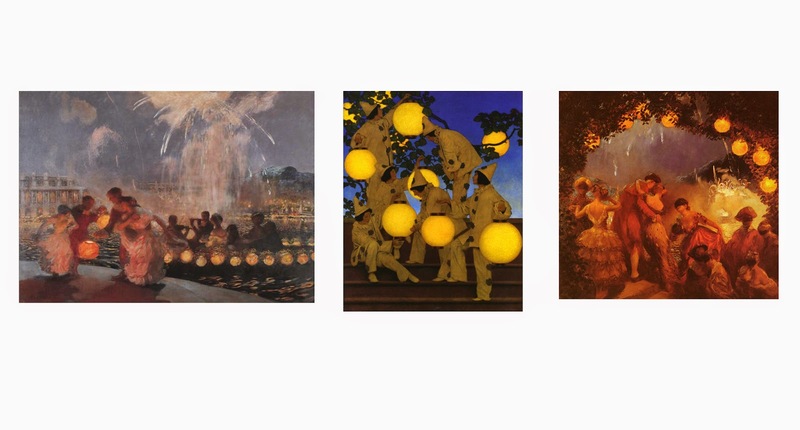 The Parish, one of his iconic images of The Lantern Bearers was painted in 1908, the La Touches painted a couple years earlier, yet interestingly all have the same sort of feeling of luminosity and focus on lantern light. To end this little tour of some of La Touche's works that struck a chord within me, A Maiden in Contemplation painted in 1893, about the time that La Touche was beginning to turn away from the somber depictions of his earlier output and move toward a more soft, harmonious and light filled world on his canvases, is another work I would like to stand in front of in person as it certainly has caught my attention in its simplicity and stark beauty. For future exploration and further reading, I've ordered Selina Baring Maclennan's book on La Touche and can't wait to dig into it. 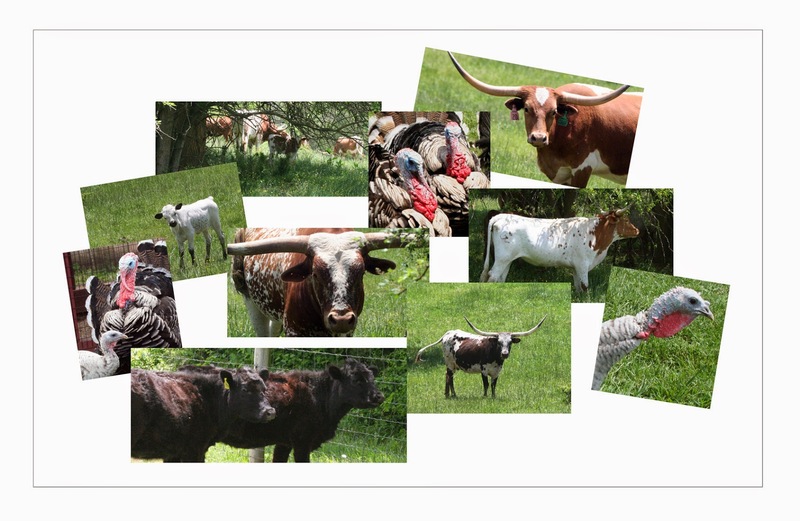 A weekend 'safari' to northern Virginia and the home of some wonderful long horn cattle, graced me with a lot of great photography and ideas for new summer works. Turkeys on the list too! Now that my two weeks' worth of small works offered through Facebook is done, I can devote some time to larger works to get out to my galleries as the summer progresses. 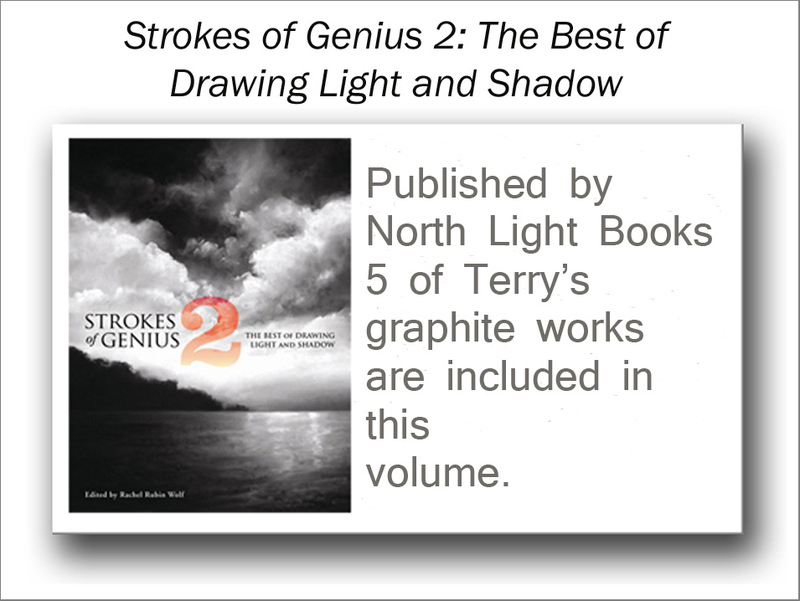 New works will begin taking shape soon. Later this morning, I'll be posting the eighth of the dozen small works that I am currently offering on my Facebook art page at special reduced prices. 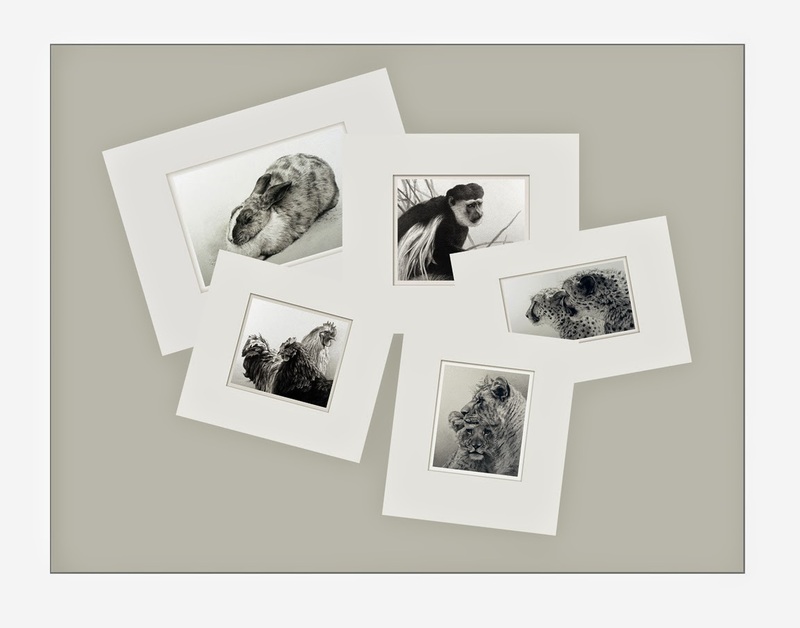 My thanks to those who have recently purchased one of the last five works offered, shown below, last week and over the weekend. 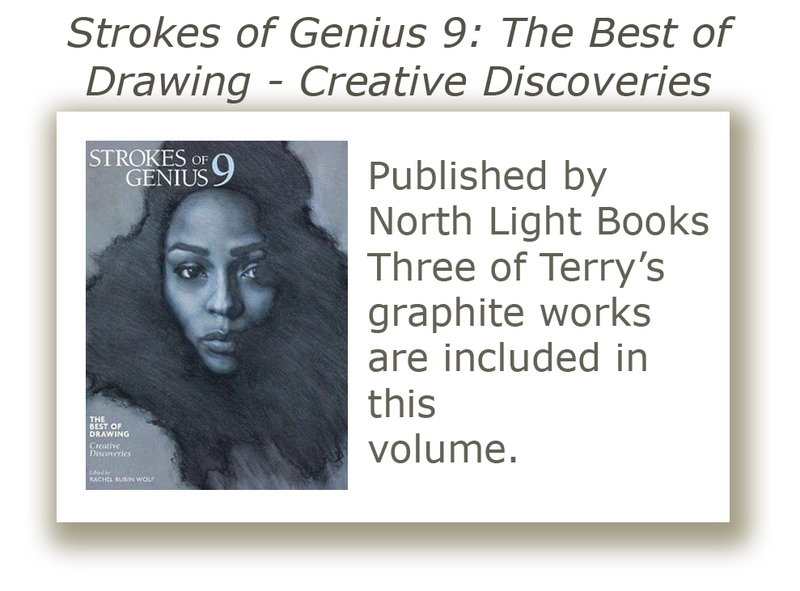 There are three more to go after today, so if you have not yet checked out the offerings, you have three days left in this round of small works. I hope to do this again in the early fall. It's not the Great Gate of Kiev, as in the closing passage of Mussorgsky's Pictures at an Exhibition, but a wonderful landscape by American-born John La Farge that greeted me as I approached the galleries containing American art and artists of the 19th Century. Paradise Valley (above), a very calming, idyllic scene was a pleasant opening into several galleries filled with the works of many artists fairly well known to me, but with many particular works that I may not have been familiar with previous to my time at The Art Institute of Chicago. Today's concluding tour through this wing of the museum will be a fast one, as there are many works I want to spotlight and actually have left out quite a few of the images shot while visiting the Institute for the sake of brevity. William Merritt Chase, a particular favorite of mine, has always inspired me with his unique vantage points and interesting angles to his compositional ideas. 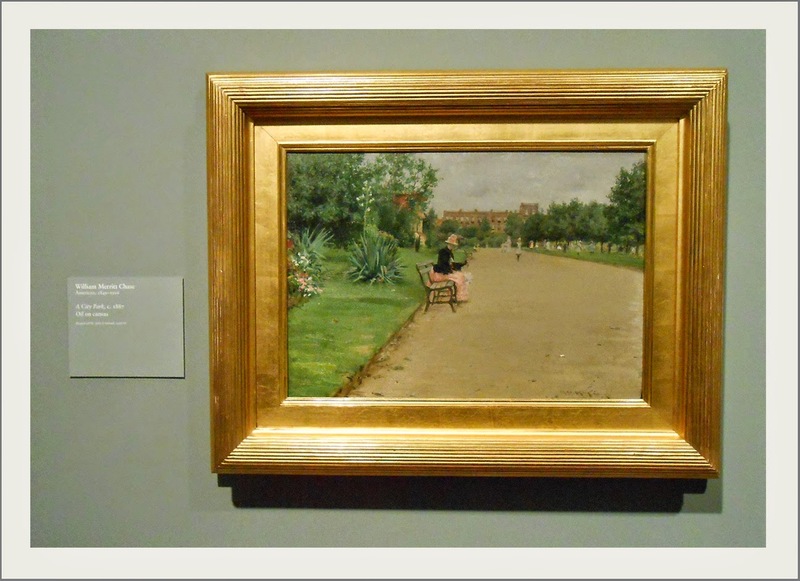 A City Park, painted in 1887 (below) is a perfect example of how, as I see it, Chase draws you into his works with great perspective and establishment of distance. I admire his ability to place his main subject, the seated woman, almost directly in the center of his canvas, which in the hands of a lesser artist might appear awkward and unbalanced, and to be able to keep the work well balanced through his focus on the long sandy walkway and the triangular shapes of grassy areas both left and right which all offer great interest, while not taking anything away from the focal point of the woman on the bench. All of those 'negative' spaces combining to give the work an overall feeling of pleasantness and equilibrium. 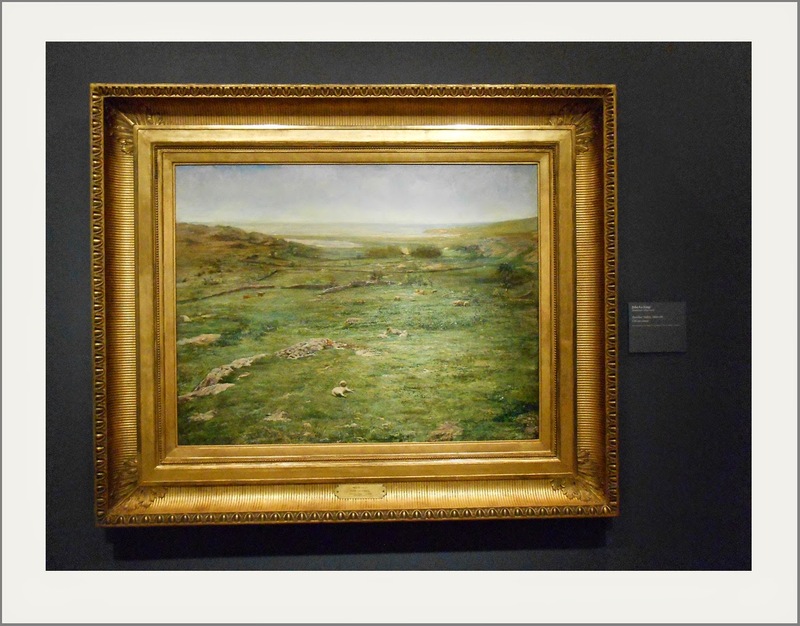 Another great 19th Century American, George Inness, has also always inspired me with the beauty of his landscapes and subtleties of his color palette. Influenced by the Barbizon School of artists, his work epitomizes the Tonalist approach to painting landscapes in the 1880s and 1890s on this side of the Atlantic. 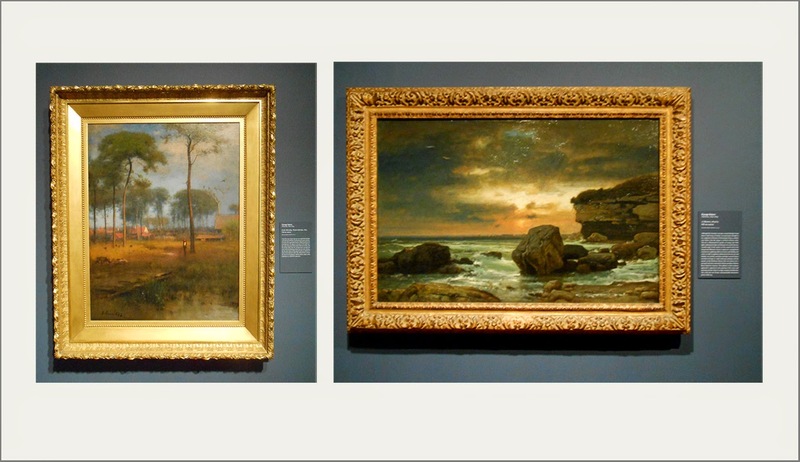 The two works below, both by Inness, show Tonalism at it's best. The next few images are of works that really spoke to me. 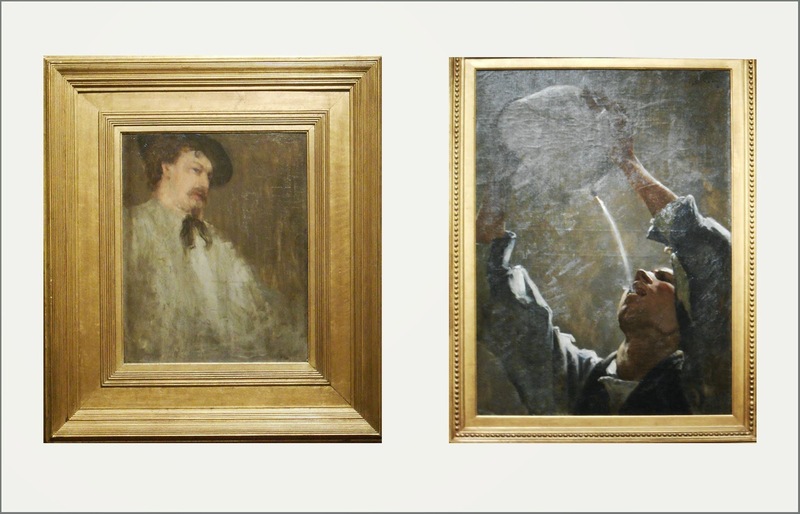 In the first pairing, on the left is a Portrait of the Artist's Brother by James McNeill Whistler. On the right is a wonderful work I had never seen before by William Turner Dannat titled, Study for an Aragonese Smuggler. 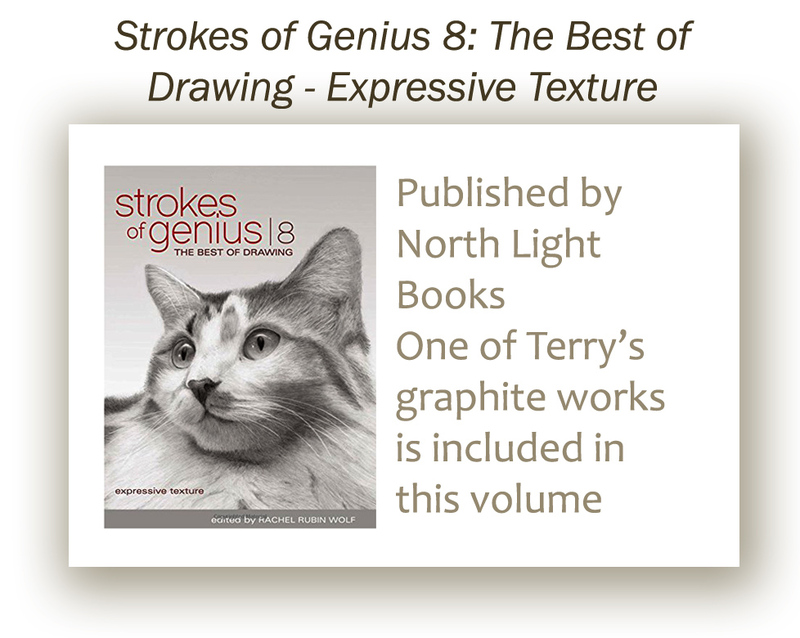 I really enjoyed the movement and evocative nature of that particular work. 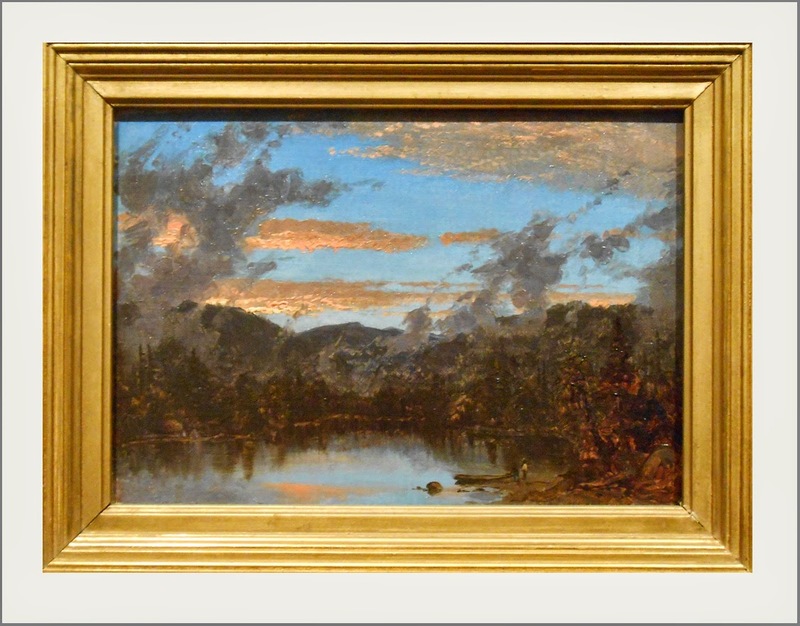 The lovely landscape, above, is by Sanford Robinson Gifford and portrays a beautiful sunset in the Catskill Mountains of upstate New York, an area quite familiar to me. 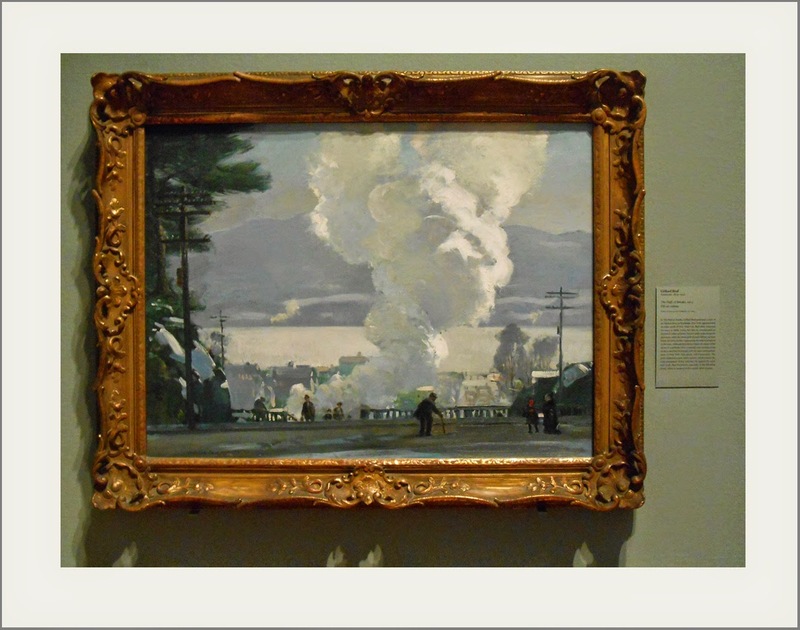 In the next pairing, I've juxtaposed another Whistler, a beautiful nocturne (on the right) with a work by Edouard Manet (Steamboat Leaving Boulogne) that was painted two decades or more before the Whistler. 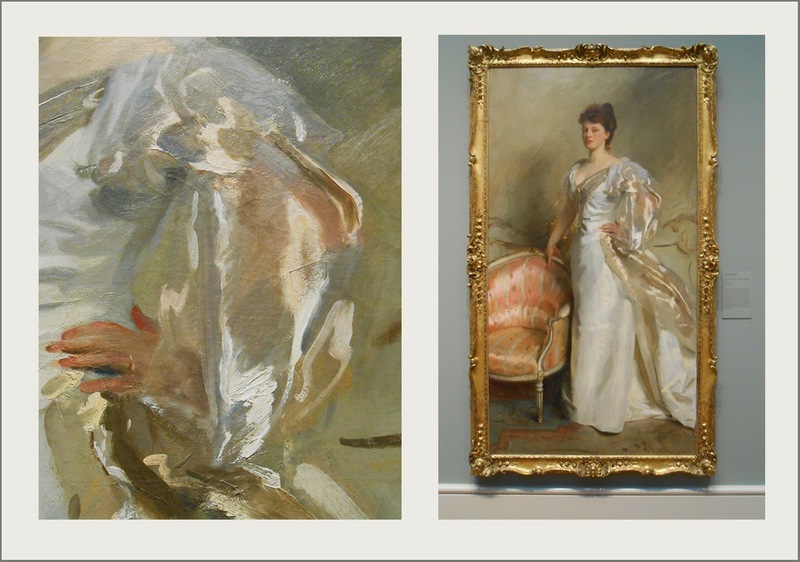 I could not help but make a very strong connection between the two works with their subdued coloration and rather indistinct brush work. A 'discovery' for me . 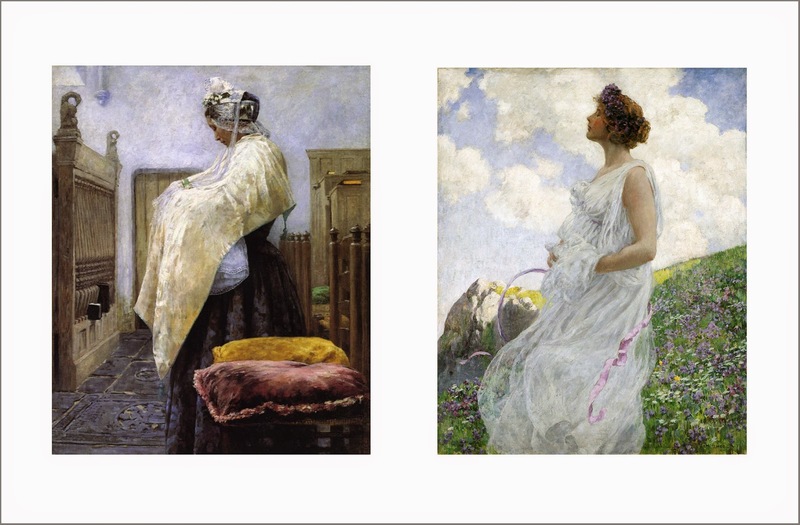 . . George Hitchcock, who lived the later half of the 19th Century into the early teens of the 20th, stopped me cold with the beautiful painting, above, Flower Girl in Holland, and again with the equally stunning work, below - The Annunciation. What visit to any museum worth its salt would be complete without seeing at least one John Singer Sargent. The Institute has several wonderful examples of his mastery of the portrait, including the one below, Mrs. George Swinton. Painted slightly before the close of the 19th Century, I was (as I always am) so taken with his beautiful rendering of satin and shiny fabric as seen in the detail to the left of the full portrait. 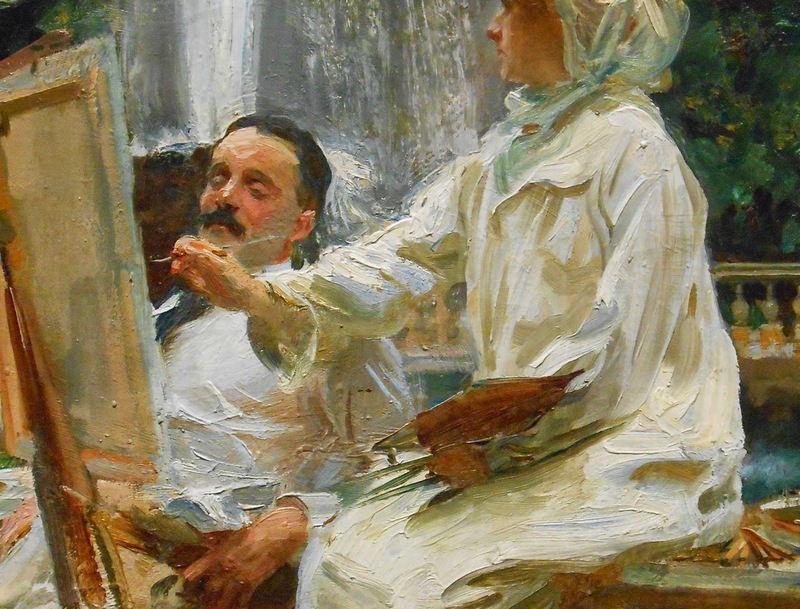 Sargent's rich brush work and application of paint, as noted in this detail, below, of The Fountain, Villa Torlonia, was another of the works in the collection at the Institute which caused me to pause and really admire his ability to push paint around! 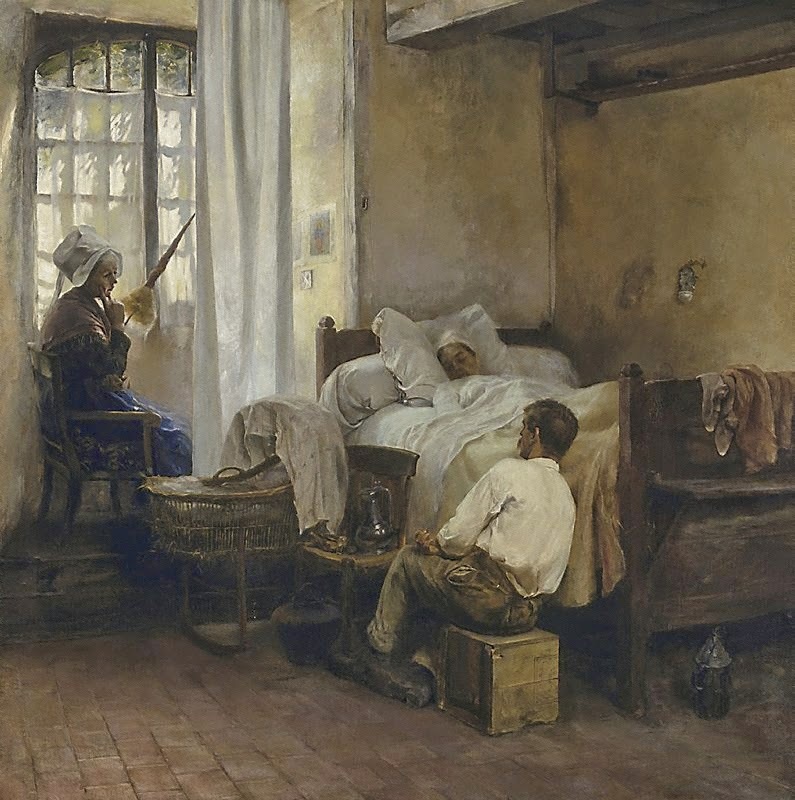 And this work, above, stunned me when I read the attribution label as being a Sargent. What a beautiful, airy rendering of Thistles. 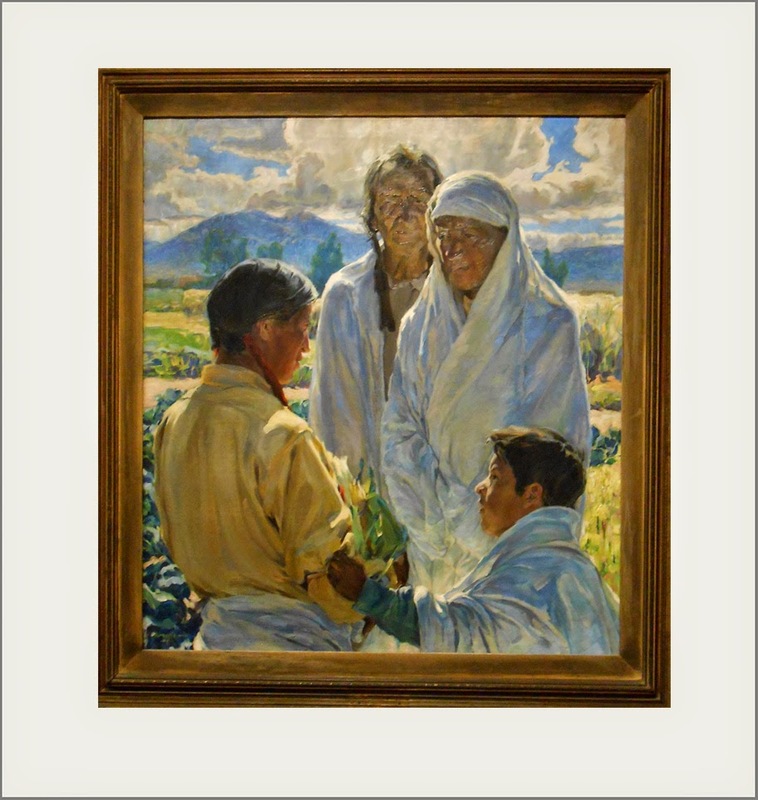 Walter Ufer's The Solemn Pledge: Taos Indians, (below) began to lead me more into the 20th Century, painted in 1916, and signaled almost the end of my time at the Institute as I enjoyed the last of the works in the gallery. 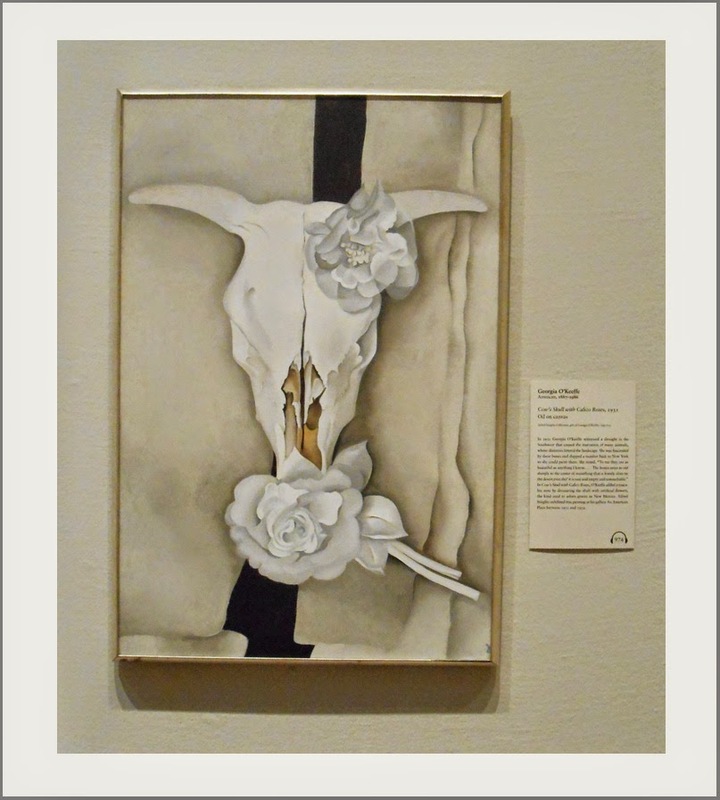 With stops at two more wonderful works, the first below by Gifford Beal - The Puff of Smoke - and the second below, one of Georgia O'Keeffe's iconic skulls, Cow's Skull with Calico Roses, my time of wandering through a hundred years worth of incredible art had come to an end. 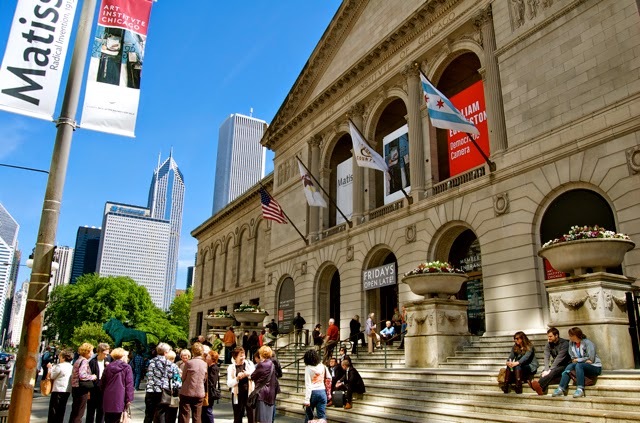 I hope to find myself in Chicago again in the not too distant future, so I can dig deeper into the vast collection at The Art Institute of Chicago. I hope also, that you've enjoyed your arm-chair visit with me! 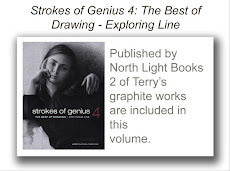 I would generally say that it would be pretty hard to follow that magnificent 'newly discovered' (for me) work I spoke about in the last posting by La Touche . . . but . . . I LOVE Degas! So, around the corner and through the door and voila, there were several works by one of my most favorite artists. First stop, above, Cafe Singer caught my attention with its implied movement and beautiful lighting; slightly mysterious but very evocative of the cabaret atmosphere. 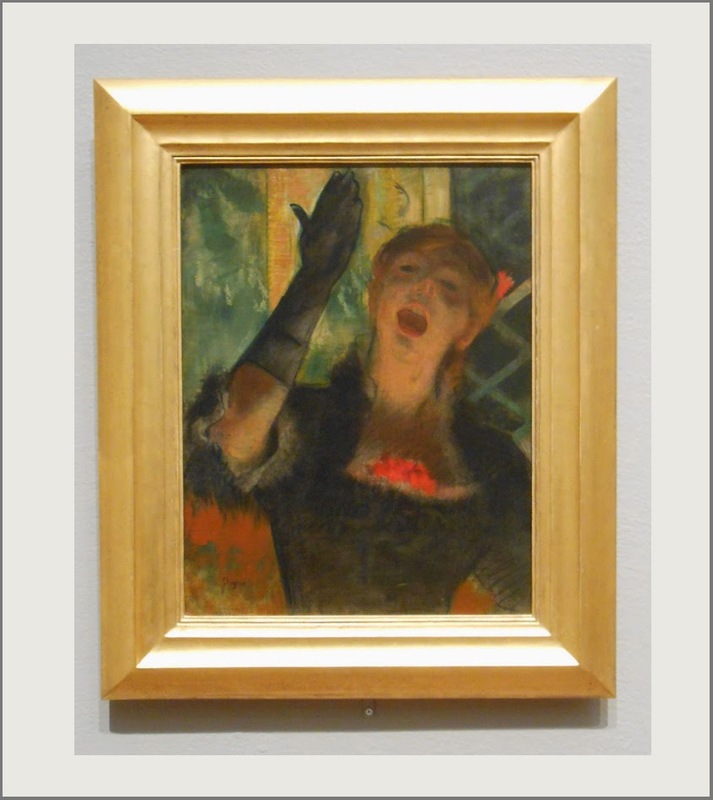 I especially liked the way Edgar took a close in viewpoint of the singer with focus on that wonderful upturned hand. The next two shinning examples of his love affair with the ballet, were worth several minutes of study. Though rather small works, each had a great pull and drew me into their captured moment in time. I loved the soft, muted pastel palette of each with just enough emphasis on the main subjects to bring them forward from all the other activity and, as noted in the closer details shown below this pair, I once again marveled at the simplified brush work. Being so interested in composition and balance as I tend to be, these two paintings showed so many aspects of well placed elements in each overall design and I read them as mirror images of one another in the way the main 'character' in each stood upon one of the horizontal third splits in the spacing of the rule of thirds - the dancer in the right hand work placed on the first third from the left and the main dancer in the left hand work placed on the first third from the right. A perfect pairing. A close up, then, of one of the pair above (here on the left) and a detail of another of the wonderful works hanging in that gallery full of dancers shows the sweep of Degas' brush work that so excites me as an artist with lost edges abounding and just the right indications of hard edges to help define arms and shoulders and facial elements. 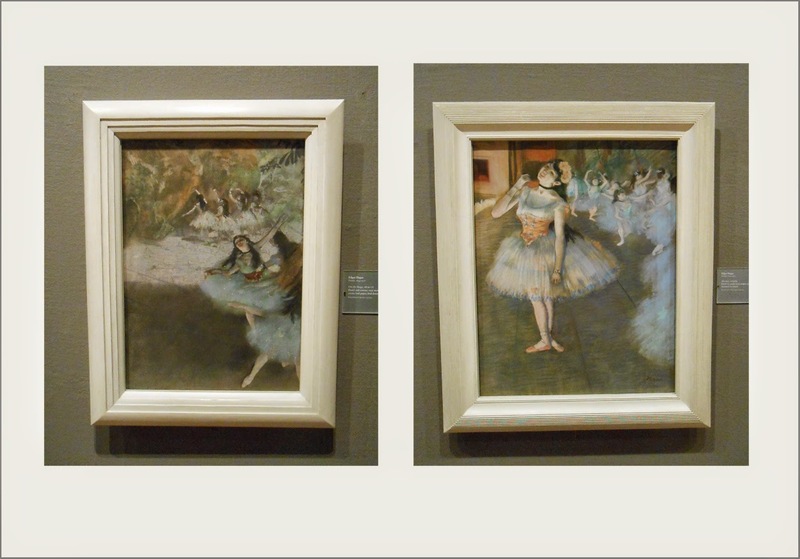 When I'd had my fill of Degas, not someone easily moved away from, I found myself moving back in time . 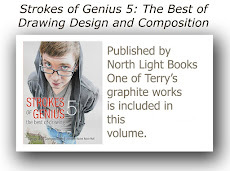 . . artistically speaking . 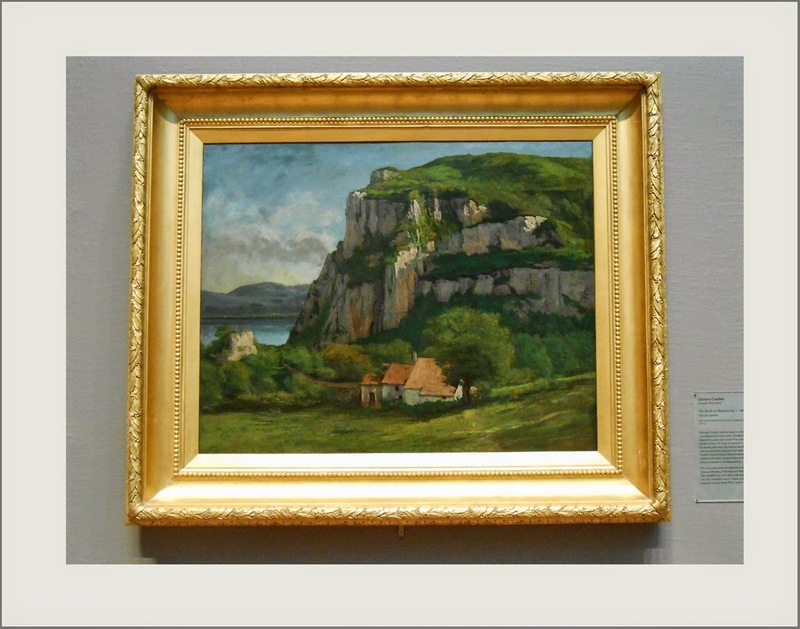 . . as I landed in front of this wonderful work of Gustave Courbet, The Rock of Hautepierre. Courbet was, perhaps, the best known of the 'Realist' painters, that group of mid 19th Century artists whose work acted as a forerunner to the Barbizon School and later on into the Impressionist era. In this particular work, I really was taken with its similarity to one of the landscapes of Cezanne that I posted earlier. The palette was similar and the brush work and soft modeling of the elements reminded me very much of Cezanne's vista of southern France and I had to pause and reflect that maybe Cezanne had indeed, studied this work or similar at some point sometime later. 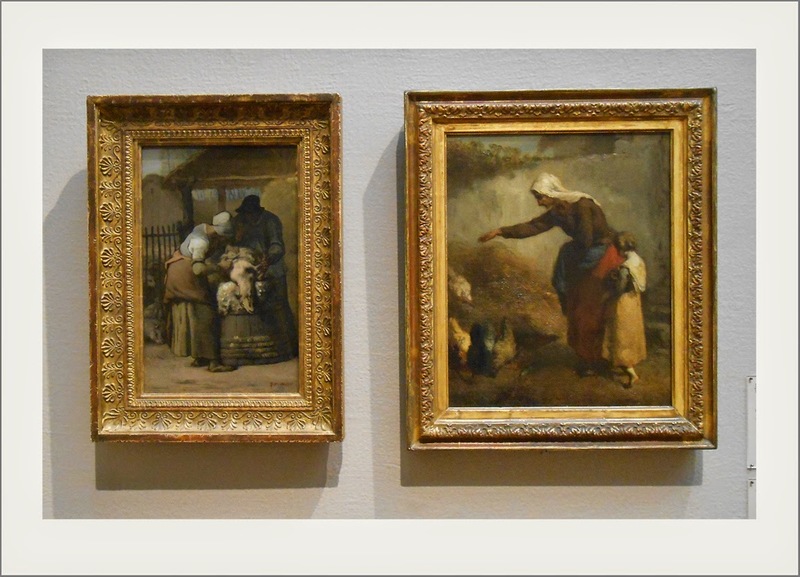 Two smaller works (seen below) on another gallery wall caught my eye and as I approached them noted both by Jean Francois Millet, who painted at the same time as Courbet and was one of the founding artists of the Barbizon School which again, helped to lead into the Impressionist period. 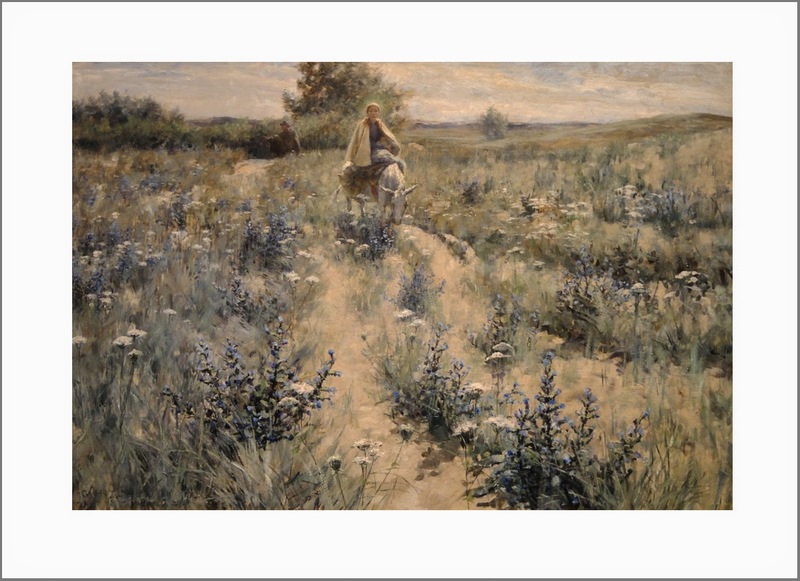 Another work from the same approximate time frame as that of Courbet and Millet (below) by Eugene Fromentin, caught my eye due to its very interesting and unique composition. 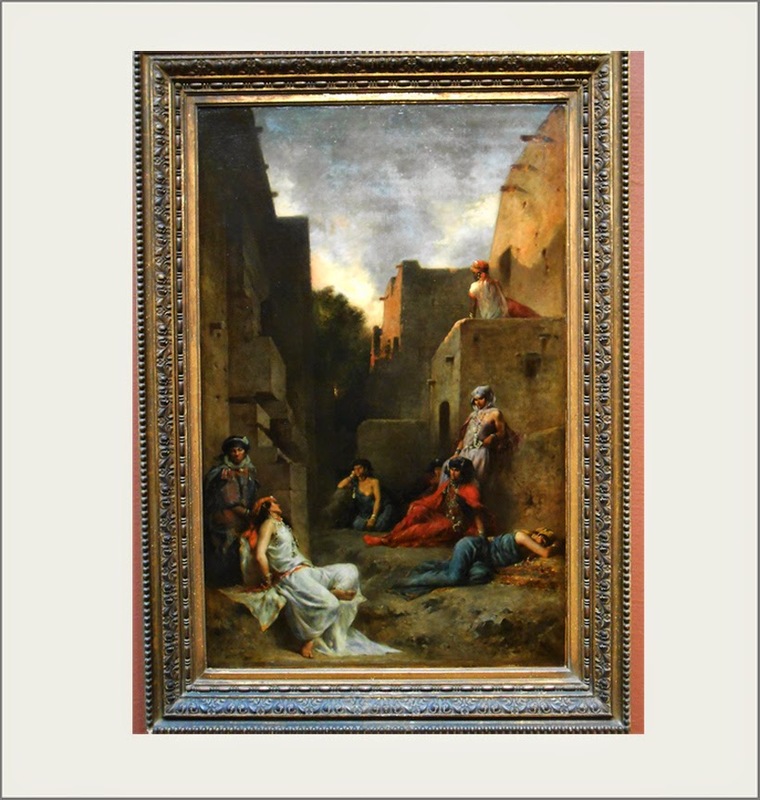 I am not that familiar with Fromentin but as this work really spoke to me, more research will be done for sure. 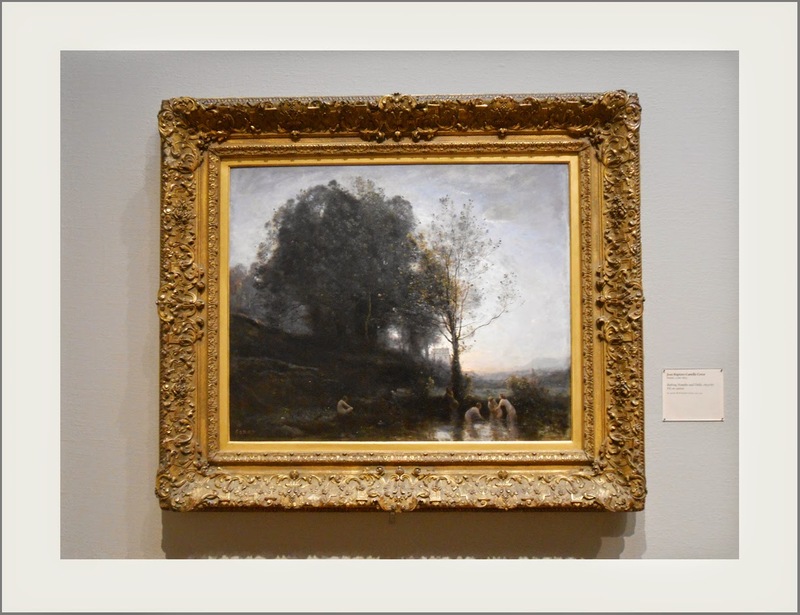 The last work for spotlight today (below) is by Jean-Baptiste-Camille Corot, the leading exponent of the Barbizon School of painters. His feathery handling of the elements of the landscape that he so loved to paint, prefaced the Impressionist's expansion of that approach to painting both in studio works and en plein air. Even More - "Pictures at an Exhibiton"
More . . . "Pictures at an Exhibition"